We are now in countdown mode as our launch date approaches this coming week. The last _____ occur frequently. Today the kids swam in the pool for what might be the last time. Yesterday Hunter went to the river with a friend for perhaps the last time. 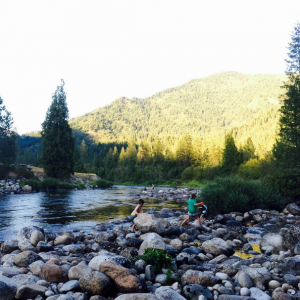 Last week we floated the river for the last time. While there is sadness at the thinning time, there is also a thick sense of urgency pushing us forward in the direction that has been pulling on our heartstrings since we first began heading down this unusual path. I watch online (via a private Facebook group called Fulltime Families) as others who have ventured out into the similar unknown sell their home and virtually jump directly into their RV while it is pulling out of the driveway. The speed at which they move from “sold” to “road” is often breakneck. In contract, it feels as though our process of leaving has been teasingly slow. Our home has now been sold for over a year and a half. We have been living in our RV for 4 months within walking distance of our storage unit allowing us to frequently make changes to what we wish to bring with. We’ve been essentially playing house and flirting with the idea of grown-up traveling. Now as the days-to-departure dip below 4, we are getting the excited jitters of impending adventure. Ironically, the preparation that would typically accompany a large-scale travel itinerary is unnecessary. We are already packed. It’s so weird. I honestly keep getting confused by this simple reality. This does not mean we haven’t had things to do. We have. Mail is now being forwarded to my sweet in-laws who have agreed to send it on to us as needed. Our travel plans for the next few months are being mapped out. Dental appointments are being squeezed into the last remaining hours. Our truck is in the shop getting a necessary repair before it can pull the RV (praying it is ready by our launch date). Our library loan number is quickly dropping as we push to finish the last few books we are borrowing (Number the Stars is almost complete). And just today the “check engine” light began flashing in our van. Clearly we have some remaining loose ends to tie up. It’s unfortunate, but often we reserve sharing the feelings hidden in the deep recesses of our hearts for times of departure. Sometimes we are better at living out intentional goodbyes than we are at living out our in-between days. …It reminded me that having a life isn’t nearly as significant as impacting one. Making an impact often requires making each moment count. After all, the moment, is the only place we really have impact anyway. These last moments are precious and fleeting. We will cling to them so they do not slip needlessly away. 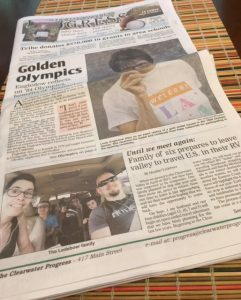 I had the fun opportunity to write an article in our local paper this week about our upcoming adventure and the blessing we have received by living here for the past year and a half. Friends that we have made here have impacted us. Lessons we have learned here have changed us. We are better because of the in-between time that we had between our “sold” and “road”. It was indeed a beautiful, unexpected intermission. As we soon pull forward, we will do so with wonderful memories staring back at us in the rearview mirror. What a beautiful thing it is to adventure with those we love. Praying your journey is more than expected and fulfilling enough to bring you back home in the perfect time. We love you! “bring you back home in the perfect time.” Well said my sweet friend. We love you back!